In 1989, Michael Rabin proposed a fundamentally new approach to the problems of fault-tolerant routing and memory management in parallel computation, based on the idea of information dispersal. Yuh-Dauh Lyuu developed this idea in a number of new and exciting ways in his PhD thesis. Further work has led to extensions of these methods to other applications such as shared memory emulations. 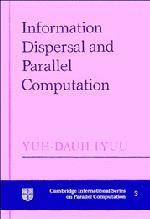 This volume presents an extended and updated printing of Lyuu’s thesis. It gives a detailed treatment of the information dispersal approach to the problems of fault-tolerance and distributed representations of information which have resisted rigorous analysis by previous methods. 1. Introduction; 2. Information dispersal; 3. Interconnection networks; 4. Fault-tolerant parallel routing Part I; 5. Fault-tolerant parallel routing Part II; 6. Node-disjoint paths in graph theory; 7. Simulation of PRAM; 8. Asynchronism and sensitivity; 9. On-line maintenance; 10. A fault-tolerant parallel computer; Bibliography; Index.